I like reading about technology and gadgets and their development. Console and arcade gaming hardware are the most interesting to me. It seems like the market for this stuff has grown in the last few years with more and more books that delve into the history and development of computer entertainment appearing in online bookshops. I've read a few books about the "history of the PC", but most of those tend to focus on the business and development of the X86/Windows PC in the 70's & 80's. They tend to be a bit dull at best and blatantly revisionist at worst. They're usually U.S. centric, most of them hardly mention Apple, revolutionary platforms like the C64 or Amiga are treated as if they never existed. So now I check the index of these kinds of history books, if it doesn't mention the "A" companies; Apple, Atari, Amiga, Acorn, or even AMD, I don't bother. In any case, I prefer books that focus on the entertainment side of computing. I've started a small collection of books, some are great some fall short of being really good. The following is a pile of short reviews of the books I own. ...see if you can spot the odd one out? This book is all about products, design and product designers, reading it has re-awakened some of the passion I used to have for creating 3D objects and the design process. Harvey Molotch looks at what drives product development from every imaginable angle. He explores in depth the effect of sociology, biology, theology, technology, geology and just about every other 'ology. Some points can seem a little laboured but that could be because he is preaching to the converted? I found the detailed insight into designers and the design process the most enjoyable reading. Molotch places the designer as hero in this story, who doesn't like being viewed as a hero? Enjoyable and deeply informative reading for the design professional or design-curious alike. I was given this book as a gift recently and read it in a week, it's that good. Jimmy Maher tells a story Amiga fans have been waiting 20 years to read. Everything from the system architecture to social impact of the Amiga is here. The author manages to keep the story entertaining and accessible even when describing the more arcane details of Amiga-kind. He manages to avoid syrupy nostalgia when describing the platform's history and maintains a fond but objective eye on the technology and it's role in the evolution of the Personal Computer. Very highly recommended for anyone who retains a fondness for the Amiga. This book is by far my favourite. It doesn't tell just one story but a story for each platform. It's also quite exhaustive and detailed, giving a page or two to just about every platform that existed between '72 and '05. The more popular platforms usually get between a two to four page history complete with colour photos, system specs, sales, no of games, etc. There are one or two printing errors and some hints at the book's Germanic origins here and there but that only makes the reading more interesting. The writing style is free flowing and highly entertaining. Taken as a whole, Forster offers a pretty complete history of gaming hardware without getting bogged down in a single, rambling narrative like some other authors might. The only problem with this book is when you hit 2005 it's over, such are the limitations of print media. One Commodore centric book I read recently; On the Edge - The Spectacular Rise and Fall of Commodore by Brian Bagnall. This book is pretty much the bible for Commodore fans, it covers the full history of the company, contains loads of interviews with the people involved and even has some nice meaty details about the development of individual projects. Bagnall writes in an entertaining and informative way and keeps the story flowing smoothly without too many dull bits. It's a bit of a tease sometimes when you can feel it getting close to, but then skirting around some nitty gritty project detail. I'd like to read more about the problem solving decisions during Amiga and C64 development, it would be interesting reading about how and why the architecture of both those machines developed. Less interesting to me are the interpersonal relationships within Commodore and its corporate machinations. Jack Tramiel is an interesting character and because of his achievements, he can get away with being domineering and demanding, but some of the engineers and marketers come across as harsh and unlikable. The Amiga team's work, pre-Commodore isn't covered in great detail yet that would be one of the more interesting parts of computer history for me. How did they do it? What were they thinking that made their approach so much more advanced compared to anyone else's? I'd like to hear the problem solving thoughts and discussions of the system architects. For anyone who's first computer was a C64 this book is an enjoyable read, though it didn't really hit its stride for me until about half way through when it looked at the familiar platforms like the C64, C128 and Amiga 500. This book offers a glimpse inside the process of creating a console, specifically it's central processing unit (CPU). Sounds a bit niche-y but it is interesting. I find the writing style a bit dry but what emerges is the story of how Microsoft effectively managed to buy from IBM the processing core of Sony's PS3/Cell CPU, giving the Xbox 360 platform limited code compatibility and accelerating the platform's hardware development time. It's hard to believe such a thing could happen and Sony are left standing in the corner, more than a little red faced. I imagine there were some tense meetings with those responsible at Sony once the truth came to light. Maybe that's why Ken Kutaragi got demoted and eventually retired from SCE? The Race for a New Game Machine is well worth the read for anyone interested in the "console wars" from a technical and strategic viewpoint. It also gives us a glimpse into the competitive world of microprocessor design and the talented people that create the machines we all so happily take for granted. I bought this book thinking it might give some insight into the technical and strategic choices Microsoft (MS) made when developing the 360. Unfortunately while this book is no Pantry Moth Trap, it is more of a business and bureaucracy story. There's a few good moments when Takahashi looks at the 360's industrial design but they're fleeting and lack much detail. I would've enjoyed more talk about the design development. While MS seem pretty happy with the way the final 360 looks, a lot of people, me included think it looks a bit cheap (probably because it is)? MS talk about making it look like it was designed by one person but it can't help but look like many cooks worked this broth. They talk about the previous Xbox as looking like a Humvee and the 360 being styled like an expensive European car. The old Xbox did look like a Humvee (which gave it brick-like character in spite of harsh criticism) but the 360 looks more Hyundai than Audi. For all their effort, it lacks the illusive simple-elegance that a genuine design classic exhibits. They quote inspiration from Brancusi's "Bird in Space" series, a subject I submitted a paper on at University. The 360 with its awkward concave power button, asymmetrical plasti-chrome DVD tray and white-satin-plastic finish looks more like a rounded, slightly imploded cereal box. There's little to suggest "the essence of flight" evident in Brancusi's artwork. Maybe I'm being too much of a design swot/snob critic? In the end, it doesn't really matter what the machine looks like. To most people it's a white (or black, or whatever), rectangular box that gets lost in the background like any other piece of disposable electronics, all it has to do is play games and have plenty of them until the next big thing comes along. That said, the new Xbox360-slim redesign does look a lot more like the old classic-Xbox Humvee. Having failed to capture European sports car elegance with the launch 360, the designers have tried something more like American muscle car; Camaro or maybe Corvette? It's a definite improvement in my opinion. I get the impression from this book that the 360's spec's were also decided by committee. These decisions were behind closed doors and the author wasn't invited as he doesn't really give us any detail on technical strategy. In light of the story another book tells, The Race for a New Game Machine by David Shippy & Mickie Phipps, it would seem there was some strategic thinking in deciding the 360's CPU. It has been observed that the underdog platform in any console cycle benefits from being at least partly compatible with the more popular leading machine. This makes cross-porting a lot easier for developers and hence there's a greater chance the underdog will get developer's attention. I can't help but think the CPU choice must have been at least partly influenced by this factor as MS had assumed the underdog status (well behind Sony) while the 360 was in planning. Takahashi misses the opportunity to discuss this strategic positioning altogether, the CPU seems to have been chosen merely because it had the best power/performance profile, end of story. Hmm? For the most part the book looks at the various players within MS and their interactions. I find all of that a bit dull and Takihashi doesn't do much to lift the mood. He also tends to repeat himself, making the same point with different words. Few of the protagonists come across as likable people. Takihashi doesn't conduct in depth interviews to reveal their personal motives, attitudes or opinions. In any case, such is the secretive nature of the industry that these people are unable to offer more than a guarded glimpse into their world. Their story lacks passion and seems impersonal or cold at times, more about corporate schmucks just doing a job in a bureaucratic hierarchy. Maybe that's what it's like working at Microsoft, it might explain a lot? The reader is left with the impression that none of these individuals play a particularly crucial or decisive role, that they regularly drop out or swap job titles throughout the 360's development speaks volumes. Pfft. Such is the technology business in the 21st century. It's a long way from the more personal story of the C64's and Amiga's development, perhaps I'm just overly nostalgic? I started playing arcade games when Space Invaders came to the deli across the road from my house. I was about six years old and it was love at first site (pun). Initially, I didn't care about sound or graphics but as time passed and the technology evolved, I started to appreciate the audio visual aspects of the games and looked back at the older 8bit stuff with less affection. In the first half, this book tends to focus on the earlier 8bit titles such as Space Invaders, Pac Man and Centipede. I never got into the latter two though I did play a fair bit of Space Invaders. For me at least, this book seems to look at a lot of familiar titles but only mentions in passing nearly all the ones I played a lot. Perhaps I played too many unpopular titles? Games such as Pengo, Karnov, Xevious, Xain'd Sleena, Gauntlet, Double Dragon and Black Tiger might not have been massive hits but they were popular enough to be in all of the arcades in my home city. Fortunately, the author mentions so many titles that there's bound to be a few we all played. The Ultimate History of Video Games (TUHoVG) is packed with quotes and comments by gaming industry personalities who give a first hand look into the business and its evolution. The gaming crash in the early 80's is looked at in great detail as is Nintendo's subsequent rise to prominence in the home (especially in the US). I liked this book a lot, the writing style is much more entertaining than many others mentioned here. The author doesn't go into great detail on any of the titles mentioned, what would've been nice is an in depth look at a few titles and their development, with comments by the coders and artists. Also lacking are any photographs or screenshots of the games, theres a few pages of black and white images in the centre of the book, mostly mug shots. I bought this book hoping it would handle games software in the same way The Encyclopedia of Game.Machines sorts it's hardware entries. TUHoVG has much of the information, the reader has to use the index and find the snippets on each page to assemble a story for each game. For a more encyclopedic treatment see below. Arcade Fever is the book I wanted The Ultimate History of Video Games to be. 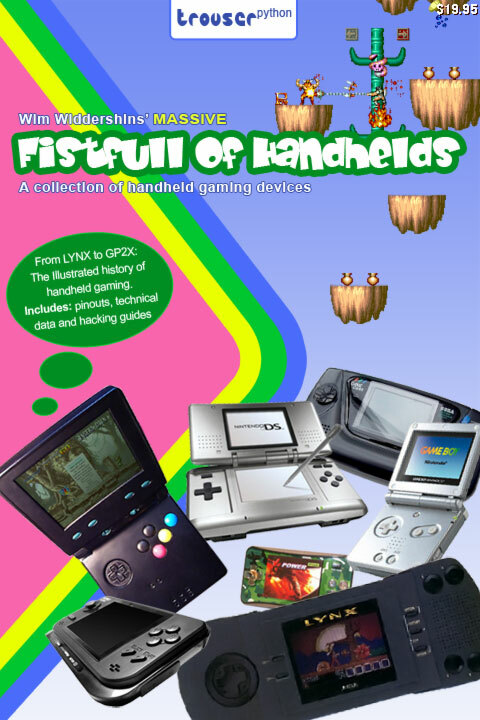 It contains a pretty broad selection of popular 8bit titles each looked at in a nostalgic way and in some detail. There's a description of each game, it's gameplay, graphics and sound. There's plenty of colour photos and screenshots and the odd piece of trivia here and there. It's a light and entertaining read similar to The Encyclopedia of Game.Machines in approach. The interview with Nolan Bushnell is a nice feature and the introductory pages are fun reading. There's not much to criticize here except the book tends to look at the most popular titles of the era. Also, the book is over too soon (which could be taken as flattery). It finishes about a decade too early for my liking, just as gaming was getting interesting with the introduction of the 16bit era. But, the title does state it's about the "Golden Age of Video Games" not, "Lesser known 16bit arcade games of the late 80's and early 90's" so I'll forgive them. There's plenty here for anyone with a nostalgic bent for popular 8bit arcade games, well worth the money. Smush elements of Arcade Fever and The Encyclopedia of Game.Machines together as well as a focus on specific software developers and you get this book. It's a fat volume and a grab-bag of gaming from the 70's to 90's covering arcades, consoles and personal computers, specific games, software developers and individuals. The Amiga and C64 even get a one page mention which earns it extra points. While the book is very US centric, it does feature an appendix looking at European and Japanese gaming in 60+ pages of detail, more points. It's a bit more jumbled than similar titles with subjects switching frequently within the chosen decade. Some games are handled with a fair bit of detail while others get just a few lines. In spite of the huge amount of informatione here, High Score is still a book that can be read casually in any order with narratives rarely stretching more than a few pages. The writing style is enjoyable and surprisingly in depth with even the smaller box-outs containing fascinating tid-bits. If anything the multitude of box-outs, side-notes and images might be a bit overwhelming for completion-ist types trying to wring every drop of information out of the hefty tome. There are hundreds of colour images in this book and it is literally stuffed with information, its a bit like reading a game fanatics scrapbook chock full of scrawled notes, photos, stories and clippings. I especially enjoyed the section specific to European gaming as that had a lot of stuff I remember fondly including games on the C64 and Amiga and the Euro-centric advertising that we used to get in Australia. I found this book in a secondhand bookstore so i didn't know anything about it when I bought it. The index doesn't mention Amiga but does mention the Atari Lynx and Jaguar very briefly so i gave it a chance. "Joystick Nation traces the brief history of computerized entertainment - the industry and its social effects - through the prism of someone who was "Born the same year as the first coin-operated videogame". It's an absorbing thematic account of how today's videogames evolved...a brainy and sophisticated riff on pop culture and, for some of us, a loving blast to the past"
There are some really nice moments in this book, like chapter 5's look at the American Museum of the Moving Image (AMMI) arcade exhibit. But like many narratives it can get a bit tedious in places and the frequent US centric references tend to disconnect non-US readers. Not as good a nostalgia fix as some of the other books mentioned here but an interesting take on the gaming industry and it's social impact. Similar to Joystick Nation (which it references p48.) but written from a British perspective which, from my perspective makes it better (for people outside of America). Video gaming ancient-recent history is skimmed through very briefly in the first few pages then the book gets up to (at time of writing) present technology (PS2 era) and the narrative references old and new mixed together. This book is, "about the aesthetics of videogames: what they share with other art forms, and the ways in which they are unique." It's not quite was I was expecting when I bought it but it is an interesting read. You can download it from the authors site. In recent years I've had a love, then hate relationship (or maybe a engaging then indifferent relationship?) with games, especially modern 3D games. Some of them try hard to be visually realistic yet display little more advance in gameplay than titles from the mid 80's. With this the case, I find books that celebrate gaming as an "art form" a bit tough to swallow at times. In an ideal world game developers would be free to create artworks, but in the commercial world computer entertainment, reality sometimes falls well short of the high art this book describes. How is yet another zombie-alien-gangster-robot killing spree advancing the art form? In the same sense that the majority of Hollywood films tend to go for superficial thrills over deep and involving stories, so to the games industry presently seems focused on high-hype, low-content productions. In a less cynical frame of mind, I do see the author's point. Gaming taken as a whole experience has a certain unique aesthetic flavour. It has the potential to present to the player a very high level of story telling artistry and characterisation primarily through intimate player involvement. Sadly, if you work your way through a random pile of games you'll quickly realise that this potential is very rarely achieved. Being a business centric book this one is one of my least favourites. It looks at how IBM failed to spot the emergence of the personal computer and lost the market to Microsoft and Intel. Interesting but a bit too far off the beaten path of video games and exotic gaming hardware for me. Snowed in for the Winter in a remote English country cottage, they were stuck fast. But when Spring's warmth finally thawed the land, they were reborn anew - on wings made of LOVE. The Pantry Moth Trap tells the tale of mental health nurse, Spadge McGillicutty and "Batty" Roy an aging sea captain. When a weekend holiday is struck by a freak snowstorm and their cottage is snowed in, Spadge and Roy are thrown together, into a storm, of their own. They are forced to face often torrid and deciduous past lives, but also they discover the promise of a hopeful future, in a serendipitous tale of conflict and romance. Next: Ramblings about Drawing and Photoshop fun.